Murakami One-Pot C SBQ Emulsion - RC Screen Shop & Supply Co.
SKU: MKS-OPSC-QT. Categories: Emulsions & Accessories, Murakami. Tags: murakami, pure photopolymer, emulsion. 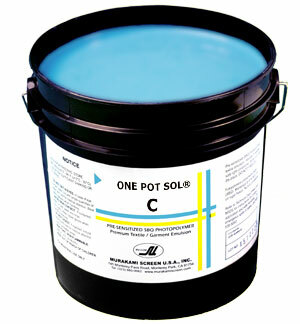 One Pot Sol C is Murakami’s premier emulsion capable of the finest resolution and details. It is designed for critical high tolerance printing found in electronics and graphics. 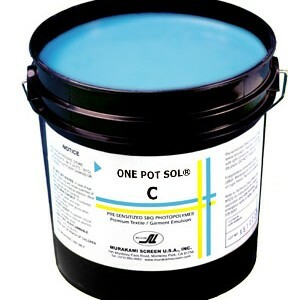 One Pot Sol C can also be used in textile 4/Color Process or simulated process printing to obtain optimum tonal ranges.